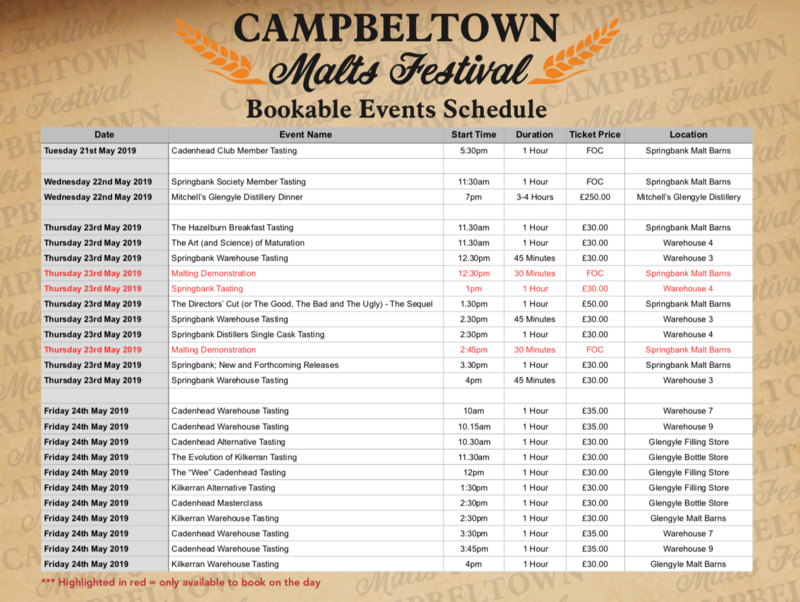 It’s time for a special entry on Inside the Cask – the first official announcement for the 2019 Campbeltown Malts Festival! Below are all the details we have to announce at this time, including what is happening during the Cadenhead/Glengyle Open day on Friday 24th May. The festival will take place from Tuesday 21st – Friday 24th May and during the four day event, we will celebrate the quality spirits produced here in Kintyre. Below, you will find all the relevant information regarding the events and tastings being hosted by Springbank, Mitchell’s Glengyle and Cadenhead’s during the festival. Over the next (almost) four months, you will be kept up to date with any additional information regarding events which will take place over the festival. In 2018, we decided that an online ticketing system would be a much easier way for our festival goers to purchase tickets. This seems to have worked extremely well with very little teething problems so in 2019, we will once again use this for ticket bookings. This will include all tickets which are available for our Thursday and Friday events, as well as our Wednesday evening dinner. We will be using a website called Eventbrite – www.eventbrite.co.uk. Wednesday tickets will be available to purchase from Wednesday 6th February 2019 at 2pm (UK time) and Thursday/Friday tickets will be available to purchase from Wednesday 13th February 2019 at 2pm (UK time). You can register on Eventbrite now to save time entering your details when you order your tickets. You will still be able to order tickets even if you do not register in advance, though it might save you time to do so. Details of the festival will be displayed on Eventbrite prior to the ticket launch, including descriptions of each tasting – which are also detailed below in each section and also in a summary timetable at the end of this announcement. It will be a maximum of 2 tickets per person for each tasting and, please note (and this is important! ), that some tastings do overlap in time so it might not be possible to do all of them. All tastings will last for approximately 1 hour, except for the Springbank Warehouse Tastings on Thursday which will last for approximately 45 minutes. Tickets for the Cadenhead Club Member Tasting and the Springbank Society Member will not be available on Eventbrite. How to acquire tickets for these events can be found later in this email. This also applies to any event that is only bookable on the day. On Tuesday 21st May at 5:30pm, the Cadenhead Sales Team will be hosting an exclusive tasting for members of our Cadenhead Club. The tasting will take place in the Springbank Malt Barns and will be a blind tasting to choose a future release for Cadenhead Club members. The Cadenhead Club Tasting will be free to attend but places are very limited so it’s advisable to book your place ASAP. Bookings can be made immediately, by emailing [email protected] Please note that we cannot allow any non-members into this tasting. On Wednesday, festival staples return as we host the Springbank Society Tasting and our special dinner at Mitchell’s Glengyle Distillery. On Wednesday 22nd May at 11:30am, the Springbank Sales Team will be hosting our annual exclusive tasting for members of the Springbank Society. The tasting will take place in the Springbank Malt Barns and will involve choosing the next Society bottling, due for release in Autumn. The Springbank Society Tasting will be free to attend but places are very limited so it’s advisable to book your place ASAP. Bookings can be made immediately, by emailing [email protected] Please note that we cannot allow any non-members into this tasting. To celebrate the 10th anniversary of the first ever Open Day that J&A Mitchell & Co. Ltd hosted, we are taking our annual dinner back to where it all began. The exclusive Distillery Dinner will be taking place at Mitchell’s Glengyle Distillery, the location of our first Open Day back in 2009. On arrival to Mitchell’s Glengyle Distillery, you will be greeted with a champagne reception which will also feature a range of locally sourced canapés. Following this, you will sample a selection of whiskies, hand drawn from the cask by a member of our senior production team. All guests will then vote for their favourite and the most popular choice will be bottled for you to take home on the night. You will then be led to your table to enjoy a four course meal with a specially selected wine to accompany each course. To end your unique experience, each attendee will be presented with their own exclusive 70cl hand drawn bottle, chosen earlier in the evening. Throughout the evening, staff from J. & A. Mitchell & Co. Ltd. will be present to chat to and share some drams with. The cost of the dinner is £250.00 per person. Tickets for this event will be available via Eventbrite from Wednesday 6th February at 2pm (UK Time). Please note this is one week earlier than all other tickets. The Springbank Open Day will take place on the third day of the festival. The day will start at 10:30am when the sale of our special Open Day bottles will commence. In addition to the tastings mentioned below, there will also be free distillery tours, local craft and food stalls, exclusive bottlings, our famous warehouse whisky bar, live music and much more happening throughout the day. Events at Springbank will conclude around 9pm. Join Director of Production Findlay and fellow Brewing and Distilling Graduate Lea as they unveil the art and science of whisky maturation at Springbank, accompanied by a range of whiskies and other wines and spirits. Sample a selection of the finest whiskies from Springbank, hand-drawn from the cask in one of our traditional warehouses by a senior member of the production team. Watch a member of our production team demonstrate our traditional malting process while enjoying a dram of one of our most popular whiskies. This free event serves as an excellent opportunity to learn about Springbank and maybe even try turning the barley yourself! Tickets are only available to book on the day so make sure you head straight for the ticket point (located in our main marquee) to book and collect your tickets. Only available to book on the day, you can join one of our Sales Team in enjoying a selection of drams from across the Springbank range, from our old favourites to the most recent releases. Whether new to Springbank or an old hand, this tasting has something for everyone. Tickets can be purchased from our ticket point (located in our main marquee) on the day. A selection of exclusive single cask bottlings which have been released around the world. An excellent chance to try rare whiskies from around the globe, all in one sitting. A chance to join us as we try some of the most recent limited releases from Springbank Distillers. The first part of 2019 has seen a number of new whiskies released and this is the ideal opportunity to try them in one sitting in the company of one our trusted Sales Team. – The Malting Demonstrations will last for 30 minutes. – The Springbank Warehouse Tastings will last for 45 minutes. – All other tastings during the Springbank Open Day are scheduled for 1 hour. – Some of the tastings will overlap so please be aware of this when making your selections. – Tasting locations will be listed on Eventbrite, as well as in the timetable included in this announcement. – Tickets for tastings that are only bookable on the day are not available on Eventbrite and must be purchased from our ticket point at Springbank Distillery on the morning of the Open Day. The final day of the Campbeltown Malts Festival 2019 will be dedicated to Mitchell’s Glengyle Distillery and Cadenhead’s Independent Bottler. Our Friday events will take place at Mitchell’s Glengyle Distillery where there will be hourly free tours of the distillery, local craft and food stalls, live music, cocktail bar and the very popular Cadenhead Lucky Dip Bar. Please note: The Kilkerran Festival Bottle will be launched on this day. Sample a selection of the finest Cadenhead whiskies with a member of the Cadenhead’s team. Each dram will be hand drawn from the cask inside one of the warehouses at Springbank, with some wonderful new casks being launched exclusively for the Open Day. As usual, anything tasted in the warehouse will be available to purchase afterwards. Throughout its history, Cadenhead’s have been about more than just excellent whisky. This is your chance to try some of our alternative spirits. The tasting will include a selection of Gin, Rum, Cognac and possibly some surprises and will be hosted by Cadenhead’s Director of Sales, Mark Watt. An opportunity to experience the evolution of Kilkerran. Be part of the journey, sampling some of the earliest Work in Progress bottlings, present day releases and a glimpse into the future with the headline Kilkerran event of the day. An additional tasting added to this year’s festival, the ‘“Wee” tasting will showcase some of our hidden gems which have been bottled and are still available in the market. We have teamed up with an experienced mixologist to showcase the alternative way to enjoy Kilkerran. During the tasting you will enjoy Kilkerran cocktails as a member of our Sales Team guides you through each of the whiskies used. The “Big” Cadenhead Tasting will feature Cadenhead’s Sales Team members, Jenna McIntosh, Cameron McGeachy and Director of Sales, Mark Watt. In previous years there have been battles between the 3, showcasing their particular drams but this year they may unite to showcase what Cadenhead’s has to offer…or maybe the truce won’t last! Keeping with tradition, there will also be a cask rolled into the venue which will be part of the tasting and available for purchase at the end. This year, we are looking for more crowd interaction so if you have any questions you wish to ask us for the event, there will be an opportunity to send them to us in the near future. Keep a close eye on our various social media outlets for more details! Sample a wide variety of the rarest Kilkerran whiskies, hand-drawn from our finest casks which have been hidden away in the darkest recesses of Glengyle. – All tastings on Friday 24th May are scheduled for 1 hour. Kate Watt, founder of Whisky Impressions is hosting two walking tours during our festival week. The first is a guided walk across to Davaar Island to see the famous Crucifixion Cave painting. A wee dram and some Scottish goodies will be provided when you get there. It can be fairly rocky underfoot to sensible footwear is recommended. Maximum 16 people. Free distillery tours will be available, which will include tastings of the core range of gins, and other spirits produced in collaboration with others. There will also be food and a cocktail bar available. The second of Kate’s tours is a Liquid History Tour. Go along and discover Campbeltown’s distilling past and present on this guided walking tour around the town. There will be pit stops at a local hostelry or two for some liquid refreshment along the way! Shot entirely on location in Scotland, Scotch – The Golden Dram tells the story of Uisge beatha, Gaelic for “water of life.” Scotch is enjoyed in more than 200 countries, generating over $6 billion in exports each year. For more than a century, Scotch whisky has been the premier international spirit of choice. It is time to tell the story of “uisge” to the world. While capturing stunning Scottish landscapes, the real heart of the film is the characters – the fascinating men and women who make Scotch whisky. The film explores some of the biggest names in the industry, including Richard Paterson, a master blender whose nose was insured for $2.5 million, Glasstorm, a company specialising in hand-made bottles for rare whiskies that sell for over $10,000 each, and the Cinderella tale of Jim McEwan, the distiller and master blender, a 50 year plus industry veteran who takes on a dilapidated distillery on his home island of Islay in the Inner Hebrides and turns it into an award-winning blend. McEwan acts as the film’s ambassador, guiding us to discover the process and the people, who they are, their personal histories, how they came to immerse themselves in the art and science of making whisky, and their drive for perfection. Featuring: Jim McEwan, Richard Paterson, Dr Bill Lumsden, Ian MacMillan, Charles MacLean, Lynne McEwan. Events to be published by Glen Scotia in due course. More information on the festival and associated events will be released over the coming weeks and months. Less than four months to go!